Read the full text from President Buhari’s Speech below. Today marks an important milestone in our desire and determination to restore normalcy and stability to the North Eastern part of our country. The devastation to human lives and livelihoods by the insurgency in the North East is severe, with more than an estimated 20,000 persons killed, an estimated 2.4 million persons displaced and billions of naira worth of personal and public assets destroyed. Many humanitarian intervention efforts, national and international, have worked over time to assist in coping with the task of bringing succour to the IDPs in and outside the region, with most of these efforts aimed at providing short-term emergency assistance and relief to the victims of the violence and displacement. However, there remains a need for better coordination of these efforts particularly the humanitarian resettlement and reconstruction of the region. Fortunately, the worst of the insurgency is behind us. This we owe principally to the valiant efforts of our military whose gallant efforts have significantly degraded the insurgency. With these successes, many displaced persons are willing and ready to return home to pick up their lives and move forward. However and sadly so, many have nothing to return to. They have lost everything to the insurgency. In addition, social and public services are also absent due to the massive destruction of public and private infrastructure. Government is committed to providing effective coordination and guidance towards addressing the humanitarian crisis, the resettlement and reconstruction of the North East region. To this end, I have established the Presidential committee on the North East Initiative (PCNI), under the Chairmanship of General T.Y. Danjuma (Rtd), GCON, a man of proven integrity, outstanding patriotism and dedication. He will lead this Committee comprising members who have been carefully chosen from a wide spectrum of stakeholders. The Committee will be the apex coordinating body for all interventions in the region including those by the public, private, national and international development partners. 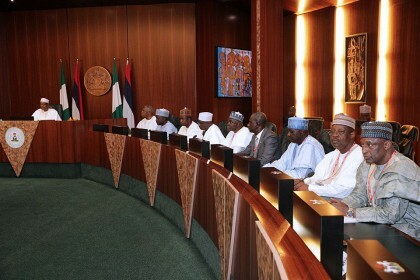 The Committee is domiciled in the Presidency and is charged with responsibility for developing the strategy and implementation framework for rebuilding the North East region. The PCNI would not exist in perpetuity or isolation. Rather, it will exist for a period of 3 years, where after it is envisaged that a long-term regional development framework or entity may be established. Meanwhile, PCNI will be funded through Federal, State and Local Government appropriation, as well as funds from the private sector and international development partners. Finally, while having great trust and confidence in the team of General TY Danjuma, I urge them to approach their task with dedication, commitment, accountability and transparency. The Committee should take a quick look at the conditions of the IDPs and take urgent remedial measures to alleviate these conditions. I also call on all stakeholders to give the PCNI their maximum support to enable it to deliver on its mandate. It is now my pleasure to formally inaugurate the Presidential Committee on the North East Initiative. Thank you and God bless the Federal Republic of Nigeria.